Today is Good Friday. For me, it’s always a day to be quiet. We don’t have school today, so I can take my time waking up (I still wake in the dark. ), sip my coffee slowly, and sit with these roses. 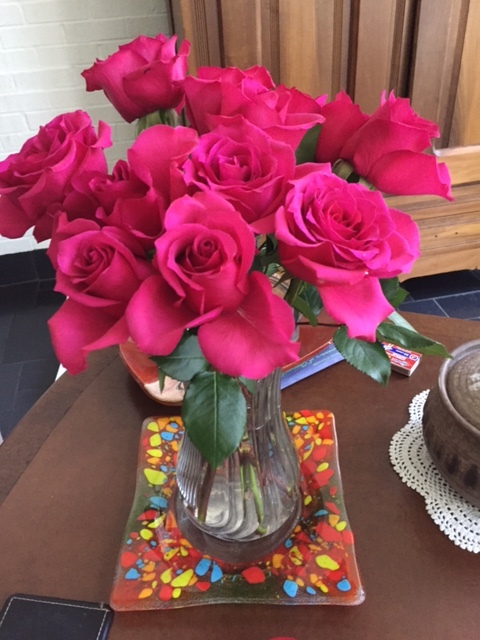 Our local grocer sells roses for $10.99 a dozen. Every once in a while, I buy them for myself. I bought these over a week ago, and they are still bright and blooming. Flowers can make the saddest of days seem brighter. So in the glow of roses, I contemplate a poem. The yarn is a tangled mess. But I left out this step. Now I am struggling with knots. we make the process harder. Poetry Friday round-up with Heidi at My Juicy Little Universe. on March 25, 2016 at 12:44 pm | Reply Rita K.
There’s much to contemplate in this beautiful poem. I’ll do just that as I, too, sit and sip my morning coffee. I am hearing Lucy Calkins say as a writing tip at my Monday conference, “Ask what is this really about?” As I read your beautiful poem, I can tell that you did that. It could have ended at the first part but it is about so much more than tangled yarn! Love the affirmation in the last stanza. Pretty roses! All the process is in the detangling. So much of life is this process. One that requires a lot of patience. Happy Good Friday! Such a lovely way to begin this Good Friday, Margaret – detangling your thoughts and finding your way to peace. This is lovely, Margaret. I often turn to knitting as a way to relax and restore myself. Working with your hands is an act of prayer. Your poem reminds me of how I felt about hanging laundry on the clothesline when we lived in Australia. It seems like a chore until you get into the rhythm of it. Then it serves as a meditation of sorts, or yes, a prayer. There are a number of posts today that tell about slowing down, listening both inside and outside, and now your poem is so quiet, showing me you sitting there, de-tangling, listening to your heart. It’s very beautiful, Margaret. This is beautiful. I love how you start with what feels like one subject and turn it into something with such meaning and truth. Have a blessed Easter celebration. This spoke so pointedly to me, Margaret. I recently realized that I have been teaching each day for 28 years like I’m hosting a grand party. No wonder I’m exhausted. : ) I’m working on letting things be quotidian, on finishing before I move on, on not needing things to be New, and Now! Thanks for the reminder. I had to ask my mother what “quotidian” means. (I’m home for the Easter weekend.) What a nice word. Thanks for your comment. A little textile therapy helps my anxieties untangle, too. Excellent poem. We were on similar wavelengths today, as Michelle pointed out. This really is beautiful. I especially love the last two lines. Love your poem. It created a sense of peace as I read it. I love roses and think it’s wonderful that you buy them for yourself. And glad that you found your mind untangling, too. Happy Easter. Beautiful. You have brought this poem to a very satisfying conclusion. Margaret, I finally am backtracking to enjoy reading the Poetry Friday posts. Your poem helps me settle into the morning writing and then on to my day. Detangling my thoughts is a very important part of any day.